Newark Mayor and U.S. Senate candidate Cory Booker greets supporters during a campaign rally on August 12, 2013 in Newark, New Jersey. 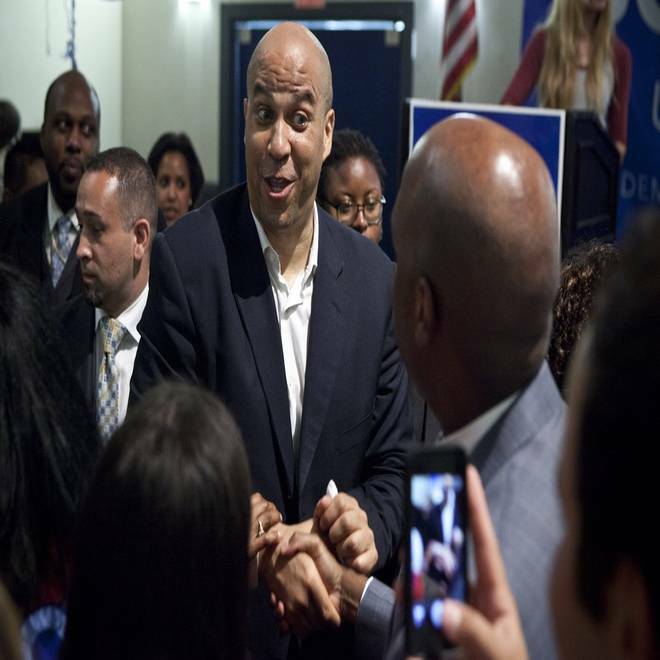 NEWARK, N.J. — Newark Mayor Cory Booker took another step toward Washington Tuesday. And to hear him tell it, the nation's capital should brace itself should he prevail in his campaign to be New Jersey’s next senator. "I don't want to just go down there and become a part of the system. I want to change it and create change for real people," Booker said in an interview on Monday. "There's in some ways a lack of imagination on a lot of people's parts." Booker easily won the Democratic nomination in a special election to replace the late Sen. Frank Lautenberg and is a heavy favorite against Republican Steve Lonegan in the October general election.. If he wins, Booker would arrive at the senate armed with a social media army that includes 1.4 million Twitter followers and a drive to shake up the system – like a Democratic version of Texas Sen. Ted Cruz. New Jersey residents deserve "a hands on, pragmatic, change agent in Washington and in New Jersey, and that's what I look forward to being," Booker said. "My record is for finding unique ways for bringing people together and disrupting broken systems, disrupting status quo." In a final day of get-out-the-vote campaigning on Monday, Booker displayed the range that's allowed him to move easily from the streets of Newark to the boardrooms of Silicon Valley. He started at a Jewish community center in Cherry Hill, where he spoke to the crowd in Hebrew (he started studying Jewish culture while he was a student at Oxford University). Then he talked for half an hour at a Baptist church in Trenton, where the pastor introduced him as his brother. He capped the day with a lengthy, off-the-cuff speech to hometown voters in Newark that was part political rally and part sermon. "You can't just hope for change, or pray for change - you've got to work for change," he said to cheers. Introducing the mayor at his Newark rally was actress Eva Longoria, who summed Booker's career this way: "Whether he's pulling people out of burning buildings or shoveling somebody's driveway or going on a hunger strike, the reputation he has is because of how much he cares about people," Longoria said. Outside of Newark, Booker doesn't seem to have supporters — he has fans. “I've been a fan of Cory since…” was a common refrain during earlier events throughout the day. "I've been a fan of Cory since I saw him campaign with Obama," said one young supporter. "I've been a fan of Cory Booker since he first ran for mayor of Newark," said a Terri Tauber, chairwoman of the Summit Democratic Committee. If Booker does win, he'll be one of the most famous faces in the halls of Congress and hold a much larger megaphone than most of his 99 colleagues. As mayor of Newark, Booker has used social media and connections with top philanthropists and technology luminaries to build a national profile — and fundraising base — that's allowed him to help both the city he leads and his own bottom line. That reality has led to wide speculation that he isn't just interested in being senator from New Jersey. Newark, N.J., Mayor Cory Booker discusses whether he would release certain financial records should he become that state's Democratic Senate nominee. "I asked him, Cory, do you want to run for president?" Longoria said as she introduced him Monday night. "And he said, 'Eva, I want to change the world, and I will do that with whatever position I hold.'" It's that kind of talk that separates Booker from the other candidates he's running against — and it's drew criticism from opponents who suggested that he's more worried about nurturing his ambitions and celebrity friendships than he is about serving his constituents in New Jersey. Leading that charge is the family of the late Sen. Frank Lautenberg, whose seat Booker would fill if he wins. "He's welcome to promote his public personality and go on television shows and give commencement speeches and so forth. I don't think that's what New Jerseyans are looking for in their senator. I don't think that qualifies him to succeed Frank Lautenberg," Holt, the New Jersey congressman, told NBC News in an interview before the polls closed Tuesday. “Frank Lautenberg followed three fundamental principles as New Jersey’s U.S. Senator: stay true to his progressive values, put New Jersey first, and be a workhorse, not a show horse," the Lautenberg family said in a statement endorsing one of Booker's opponents, Rep. Frank Pallone. Booker defends his celebrity status, saying that all the attention has benefited his city. "Before I became mayor, Newark's reputation nationally was crime and corruption," Booker said. "And what we were able to do is really change -- forget my brand -- change the brand of the city of Newark." "I will go anywhere, meet with anyone, famous or not, if you have ideas," he said. But whether Washington is a place Booker can change is still an open question. He would be walking into a Congress that's one of the most polarized in history -- and into a Senate that cherishes seniority and tradition, where longtime members often bristle when newer faces buck the system or win the press coverage. Booker says he plans to try to make friends. "You should always lead with love, lead with kindness, and just be good and decent to people. I'm not one of those firebrands that throws Molotov cocktails at people and the like," he said when asked if he expected a warm reception from possible Senate colleagues. And if not? Well, he says that confrontational junior senators are making big marks nowadays. "Elizabeth Warren, to Rand Paul," Booker said, "and Ted Cruz." Clarification: This story has been updated to reflect that Booker also named Democratic Sen. Elizabeth Warren as an example of a junior senator with a high profile.